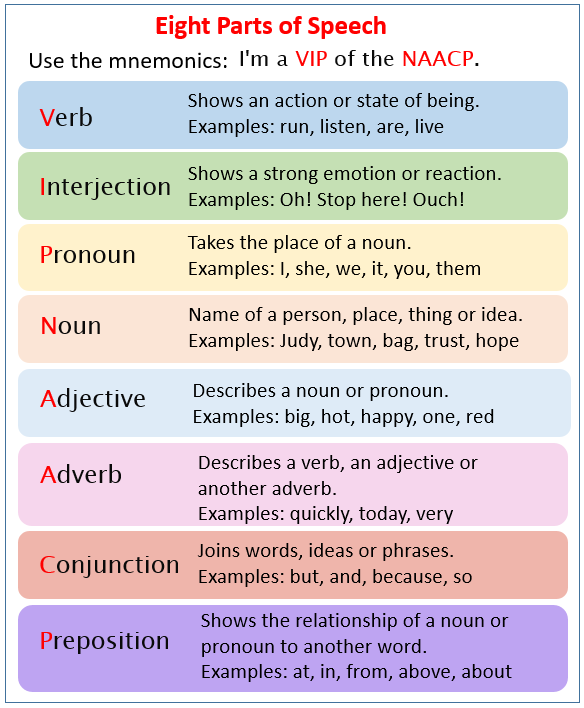 The following figure gives the eight parts of speech: verb, interjection, pronoun, noun, adjective, adverb, conjunction, and preposition. Scroll down the page for more examples and explanations. Previous Page for explanations on verb, interjection, and pronoun. Eight parts of speech revisited. Verb, interjection, and pronoun reviewed. Noun introduced. Eight parts of speech revisited. Adjective is introduced. Eight parts of speech reviewed. Conjunction is introduced, with an emphasis on coordinate conjunctions. Eight parts of speech reviewed. Preposition is introduced.